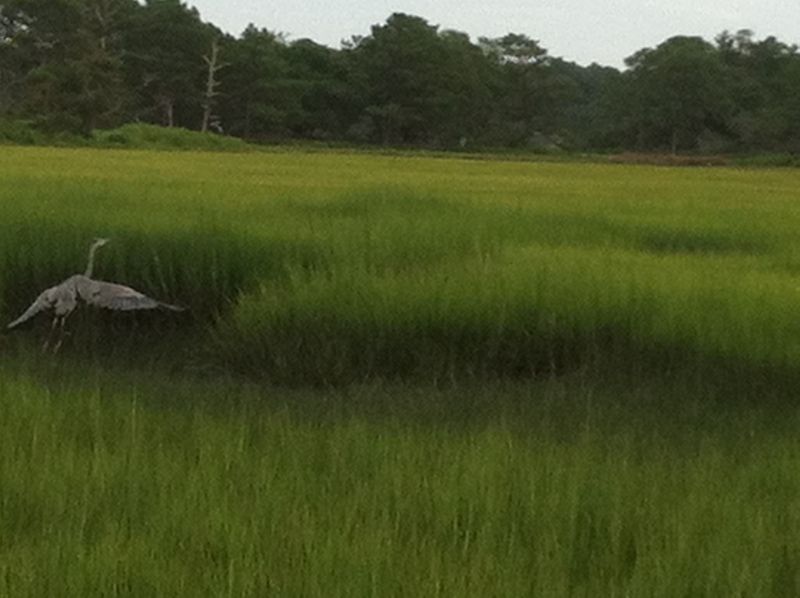 Great blue heron taking flight. A week away. It is a luxury most citizens of the world never experience. For those of us lucky enough, it seems as if we could not live without a week away, now and then. For people with enough money to live without financial fear, time often seems as valuable as money. I doubt an unemployed, homeless or starving person would think so. But for the purposes of this blog, I will proceed from the proposition that time is a rare and precious commodity, like oil, real estate with a view, diamonds, fine wine or a thoroughbred horse. My favorite place for a week away: Chincoteague Island, VA. A barrier island with another barrier island, Assateague, beyond it, a mere causeway away, where pristine beaches and wild ponies can be found. But now I ask myself why, when I give myself the gift of time, is it so hard to cherish every moment, guilt free? If I am doing something that seems “useless” – like watching an episode of Game of Thrones on my computer – I think, “I could do this at home in the evening, after dinner dishes are done. Why do it here, on vacation?” If I linger for an extra hour with a book in the morning, before getting everyone motivated to do something “vacationish,” I have failed at my maternal job of helping everyone drain the last drop of fun and relaxation out of the week. As emails from work and clients clog my inbox, I wonder if my “vacation response” is good enough? Once the daily heave-ho takes place and I finally find myself sitting in a lowslung chair on the beach, brushed by the persistent sea breeze and letting only my tiptoes peek out from the edge of my umbrella’s shade, I let it all go for awhile. I can lose myself for hours. The gulls’ needle sharp caws, the shushing of the waves and the wind muffled sounds of nearby children building ramparts against the tide lull me as few things can. I love the way my skin accrues a gentle, gradual skin of sand granules atop sticky salt atop sunblock. When the sun lowers, I drag my chair to the water’s edge, nudging back against the off shore wind, holding my hat on my head, reading in the slanting light until the sand on my skin is less fun and it is time to break the spell. And though I fear the waves, I love the feel of the ocean holding me up. I have the strangest relationship with water. I am drawn to it only on the shores of oceans. It’s the tides that draw me, but not to play or body surf or boogie board as my family can do for hours and hours. But to “bob” as we call it. To get past the scary breaking surf to where the waves just swell and pass by, lifting my body as if it weighed no more than a jellyfish. Ever since the time, about 15 years ago, when I lay on an inflatable raft and “bobbed” my way out too far, I have maintained an enhanced respect and attunement while in the ocean. But though I never quite relax in those gentle swells—I know they can become ungentle in a heartbeat—I feel embraced and loved by the universe in a way I never do anywhere else. This past week, we reserved spots on a boat that circled the island. Because Chincoteague is bracketed on one side by the mainland and the other by Assateague, most of the trip was in the inlet waters between bodies of land. At the southern tip we entered open sea for an exhilarating 20 minutes or so. This trip provided two joys—speed and getting close to places I could not see any other way. I no longer downhill ski with the abandon I once did, so hitting that adrenaline high of open-air speed that I not-so-secretly love is a rare event. Sitting in the prow of the boat as it zipped around the tip of the island sent me into a luscious trance. 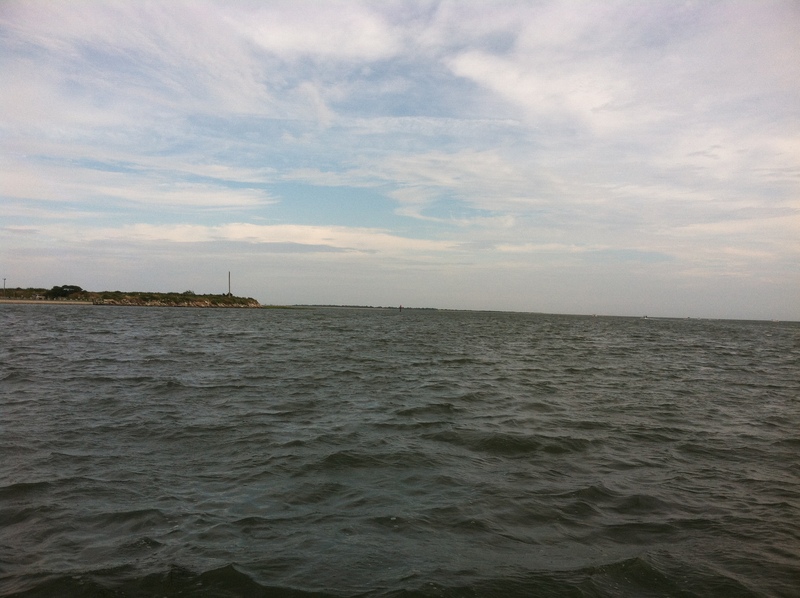 The boat slowed often, to show the sights and to edge into the circuitous lanes, called “guts,” that wend through the marshy edges of Assateague. In the silence of those moments, we saw wild ponies, herons, egrets, even a bald eagle, who perched like a pagan icon on the sea-rotted stump of an old dock foundation. For the three hours of that boat tour, I let everything go. I did not think about my clogged inbox. I did not feel torn about where I “should” be or what I “should” be doing (what an absurd idea!). I did not think about the dinner that awaited (even though it was the best BBQ on the Eastern Shore). If I had any responsibilities in the world, I was not thinking about them at all. There was nowhere else I would want to be—ever, it seemed. As the sun set behind buttermilk clouds and the lighthouse started to send its beacon, the air chilled. Our captain handed me a blanket on cue, and I continued to simply be. 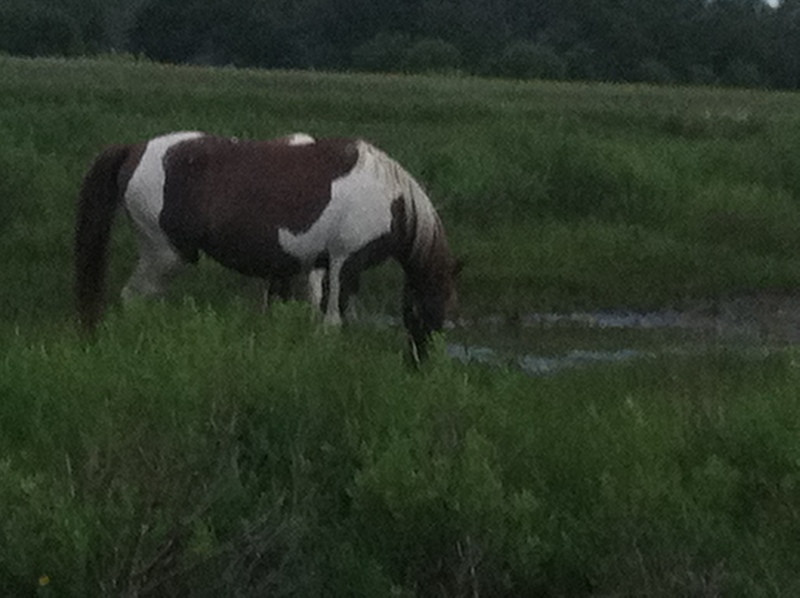 Wild pony on the shore of Assateague Island. Open sea. Island tip in the distance.